Relativity Media’s visually-stunning epic 3D adventure Immortals exceeded both internal and external industry estimates leading the company to its highest box office opener as an independent distributor, taking in an estimated $32.2mm in 3,112 locations in North America and $38mm internationally from opening in 35 countries, it was announced today by Kyle Davies, Relativity’s President of Worldwide Distribution. Opening on 11-11-11, the film impressively took the # 1 spot in America and became the highest R-Rated action film this year and the third highest-grossing R-rated film debut in 2011 behind The Hangover 2 ($85.9mm) and Paranormal Activity 3 ($52.6mm). Directed by Tarsem Singh, and from the producers of 300 Mark Canton, Gianni Nunnari and Relativity’s Ryan Kavanaugh, Immortals is completely original and not based on a comic book, novel or a previous film. Relativity mounted a robust marketing and publicity campaign toward a broad audience, beginning by targeting the elusive under 35 male demographic, and leveraging innovative partnerships with such companies as Clear Channel Radio, MTV, Best Buy, Carl’s Jr.®, Spotify, Richard Petty Motor Sports and Virgin Mobile to reach beyond the targeted under 35 male demographic. Exit polls indicate that Immortals reached that specific group and beyond, as 75% of its audience was under 35 (with 60% of that audience consisting of males and 40% comprising of females) and 25% was 35 and over. Exit polls also indicated very strong response in both rating and recommendation scores from the younger demographic (males and females under 25). 70% of locations played the film in 3D. 66% of the gross was on 3D screens with 34% on 2D. 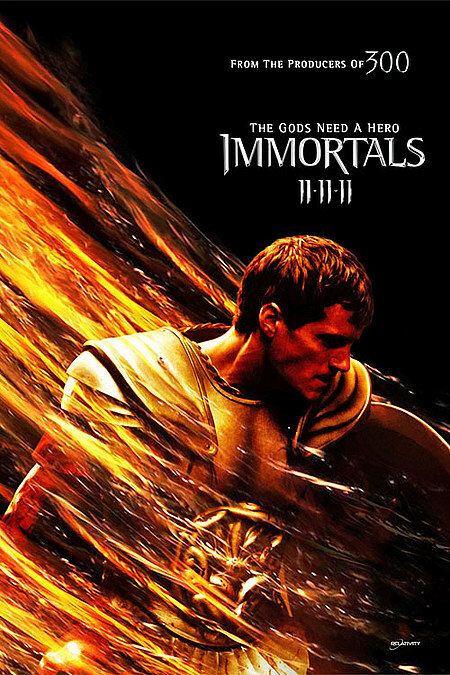 Relativity owns worldwide rights to Immortals with Lionsgate handling foreign sales. Immortals opened day and date with the U.S. in over 35 international territories including: UK/Universal, Germany/Austria/Constantin, Italy/RAI/01 Distribution, Japan/Universal, South Korea/Next Entertainment World, Turkey/Aqua Pinema, Taiwan/Studio Solutions Group/Catchplay, Netherlands/A-Film, Greece/Village Films, South Africa/Nu Metro, UAE/Gulf Films, and CIS & Eastern Europe/Paradise/MGN. Immortals is the first Relativity title released in China through Sky Land, its joint venture with IDG and Saif Partners. The current estimated weekend box office is approximately a solid $38mm+ with a number of territories still to report. The rest of the world will open by the Christmas holiday including France/Metropolitan, Belgium/A-Film/Belga, Australia/New Zealand/Universal, Denmark & Norway/Nordisk, Portugal/Prisvideo, Brazil/Imagem, Mexico/Gussi, Spain/Universal, among others. In Relativity’s first year as an independent distributor, Immortals marks the studio’s second over-performing film to reach the #1 spot in America, following Neil Burger’s paranoia-fueled action thriller Limitless, starring Bradley Cooper and Robert De Niro in March of this year. Both titles were produced internally by Relativity. “We are thrilled that our homegrown epic Immortals performed well above internal and industry projections and are gratified that our core audience showed up to this wholly original film. We’re also enthused by the broad and ethnically diverse audience, hoping the positive word-of-mouth will continue the movie’s playability through the Thanksgiving holiday,” said Davies. Immortals stars Henry Cavill (Superman: Man of Steel), Luke Evans (Robin Hood), Kellan Lutz (Twillight), Isabel Lucas (Transformers: Revenge of the Fallen), Freida Pinto (Slumdog Millionaire), Stephen Dorff (Public Enemies), Daniel Sharman (The Collection), Stephen McHattie (Watchmen), Greg Bryk (A History of Violence), Peter Stebbings (Jeremiah), Alan VanSprang (Saw III), John Hurt (Hellboy) and Mickey Rourke (Iron Man 2). Directed by Tarsem Singh (The Cell, The Fall) and written by Charles Parlapanides and Vlas Parlapanides, Immortals tells the story of the ruthless King Hyperion (Rourke), who leads his bloodthirsty army on a murderous rampage across Greece to find a deadly weapon that will destroy humanity. A mortal chosen by Zeus named Theseus (Cavill) must lead the fight against Hyperion and his evil army with the fate of mankind and the Gods at Stake. The film is executive produced by Relativity’s Tucker Tooley, Working Pictures’ Jeff Waxman, Tommy Turtle, Virgin Produced’s Jason Felts and co-executive produced by Voltage Productions’ Craig Flores, Relativity’s Robbie Brenner and Virgin Produced’s Rene Rigal. Relativity’s Kenneth Halsband served as co-producer. The next film on the studio’s growing slate is Oscar®-winner Steven Soderbergh’s dynamic Haywire debuting in theatres January 20, 2012. This highly anticipated action-thriller stars Channing Tatum, Michael Fassbender, Ewan McGregor, Michael Angarano, Antonio Banderas, Michael Douglas, Bill Paxton and introduces mixed martial arts (MMA) star Gina Carano in a demanding lead role that has her performing her own high-adrenaline stunts. Haywire tells the story of Mallory Kane, a highly trained operative who works for a government security contractor in the dirtiest, most dangerous corners of the world. After successfully freeing a Chinese journalist held hostage, she is double crossed and left for dead by someone close to her in her own agency. Suddenly the target of skilled assassins who know her every move, Mallory must find the truth in order to stay alive. Using her black-ops military training, she devises an ingenious – and dangerous – trap. But when things go haywire, Mallory realizes she’ll be killed in the blink of an eye unless she finds a way to turn the tables on her ruthless adversary. The release marks Soderbergh’s 25th film. Relativity Media just wrapped production on the hilarious comedy 21 & Over and is currently in pre-production on Nicholas Sparks’ gripping love story Safe Haven and the international espionage thriller Hunter Killer. Relativity’s expansive upcoming slate also includes: Act of Valor, a heart-pounding action film starring active duty Navy SEALs (in theatres February 17, 2012), a gritty thriller The Raven (in theatres March 9, 2012), the magical adventure comedy Mirror Mirror (in theatres March 16, 2012), starring Oscar®-winner Julia Roberts, Lily Collins, Nathan Lane, and Armie Hammer and edge-of-your seat thriller House at the End of the Street (in theatres April 20, 2012). To date, Relativity has produced, distributed, and/or structured financing for more than 200 motion pictures. Released films have accumulated more than $16 billion in worldwide box office receipts. Relativity’s recent films include: Immortals, Tower Heist, Bridesmaids, Hop, Limitless, Anonymous, Machine Gun Preacher, Cowboys & Aliens, Battle: Los Angeles, Season of The Witch, Little Fockers, The Fighter, The Social Network, Salt, Despicable Me, Grown Ups, Dear John, It’s Complicated, Couples Retreat and Zombieland. Upcoming films for Relativity include: Haywire, Act of Valor, The Raven, Mirror Mirror,21 Jump Street, American Reunion, and The Bourne Legacy. Thirty-eight of the company’s films have opened to No. 1 at the box office. Relativity films have earned 60 Oscar® nominations, including nods for The Fighter, The Social Network, The Wolfman, A Serious Man, Frost/Nixon, Atonement, American Gangster and 3:10 to Yuma. Fifty-nine of Relativity’s films have each generated more than $100 million in worldwide box-office receipts. Relativity also owns and operates Rogue Pictures, a company that specializes in films targeted to the 13-25 year old audience, and RogueLife, Relativity’s digital studio which is developing original content for the Web and creating sustainable online platforms and communities. RelativityREAL, Relativity’s television arm, has 67 projects in production, including 17 original series that are currently airing or will air in the upcoming television season including Police Women for TLC, Coming Home for Lifetime and The Great Food Truck Race for Food Network. For additional information, please visit www.relativitymediallc.com.